What a glorious start to the Spring! I hope you too enjoyed some lovely sunshine so far this week. I wanted to talk about the ever popular 40s. Recently I have found I get more requests for 40s vintage wedding dresses, than any other decade. 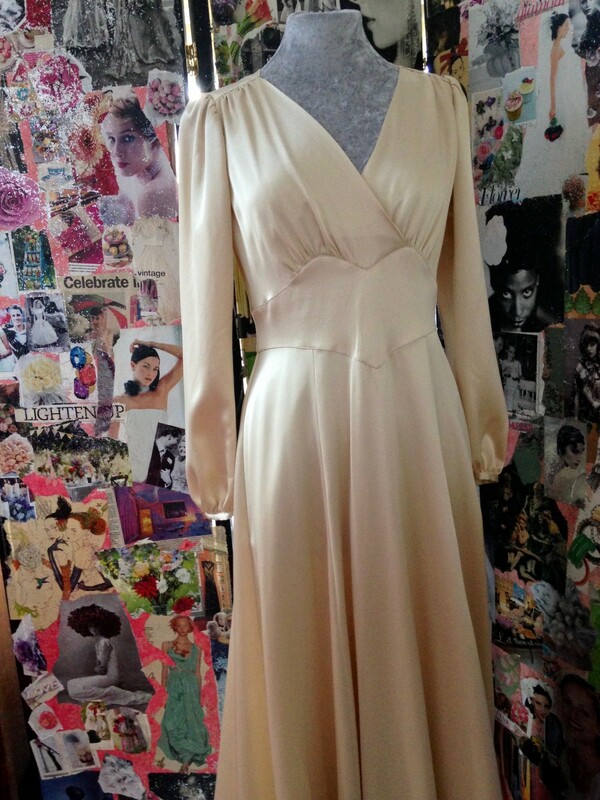 I have two reproduction 40s vintage wedding dresses- Bette, in glamorous silk crepe and Florence in elegant silk satin. Bette is made from a wonderful silk crepe, and has all the glamour of a Hollywood evening gown. The heavy silk drapes beautifully, and is so figure-flattering. And so too is Bette’s clever asymmetric cut, with soft pleats and a gentle cowl neck. Bette’s low-cut back, and ivory and silver bead trim add even more movie-star sparkle to this gorgeous dress. Florence, (shown below) is a very classic, beautiful and versatile dress, it can be made with many different sleeve styles – to my clients taste. And in some beautiful soft shades of champagne, gold and silver. 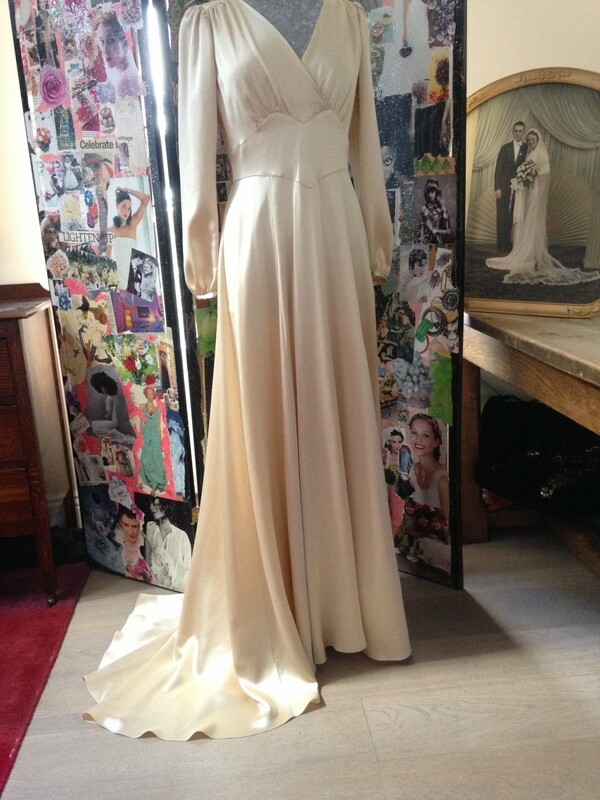 Shown here is a recent pale gold silk dress which was made for a charming client Lise, who was married at Christmas. Here is an other variation on Florence, with a short sleeve and in a pearly, champagne coloured silk satin called Sea Pearl. If like me, you are a fan of 40s glamour, do come and see a sample. Depending on silk choice, Florence is priced from £1395 to £1495 plus fitting (usually just fine tuning).